Are you looking for a way to turn your backyard into a garden oasis? Scott Design & Construction can help you achieve your dreams with a custom-built waterfall. The artistic beauty of a water installation adds appeal and value to your home. It also makes your home and garden a special place that you will love to come home to. Adding a water feature to your outdoor living space has so many benefits. The sound of the water naturally blocks other noises from your neighborhood such as cars, animals, and the surrounding houses. The soothing sound of water trickling downwards into a natural pool or pond area relieves stress and has a calming effect on the mind and body. Many people enjoy meditation or yoga exercises enhanced by the visual and ambient effects of a waterfall. Waterfalls are especially treasured during the long hot days of summer. Imagine being able to dip your toes in your pond crafted by Scott Design & Construction. Sit beside your one of a kind waterfall and be gently splashed by fresh cold water while you relax with an iced tea. Your kids will love having a waterfall too, where they can let their imaginations run wild. Eric Scott has been a local landscaper in Texas since 1989. His affinity for the outdoors has provided him with keen insight when it comes to designing and constructing waterfalls for his clientele. He provides quality work that he and his employees stand behind and can be proud of. Eric is an experienced landscaper and craftsman with the ability to work in many different mediums. He provides each client with the finest quality work and support. Whether you are looking for a natural stone waterfall or something sleek and modern, Scott Design & Construction is there to help you. Because every outdoor space is different his team of experts will assess your yard to give you the best options available. 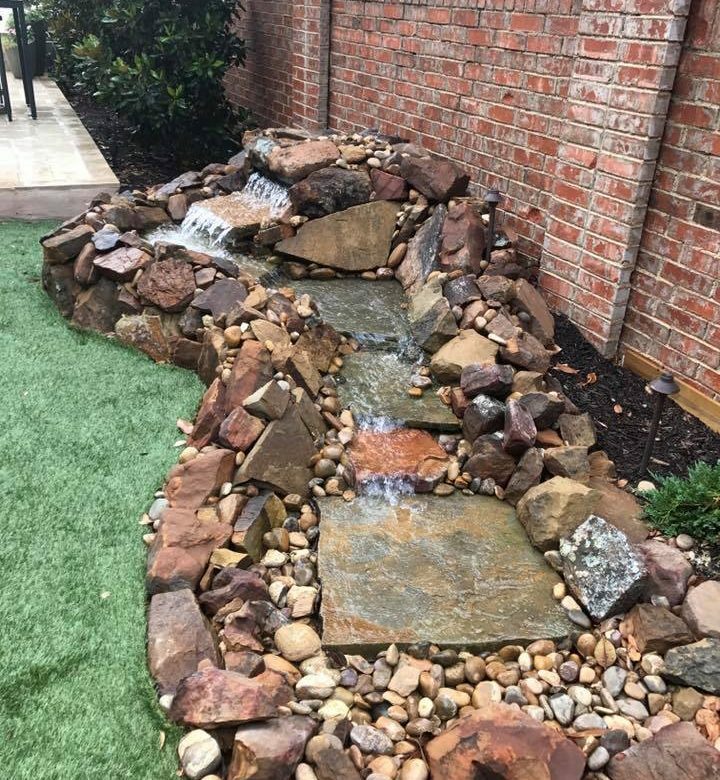 Each client has specialized needs, whether the waterfall will be used to block sound or add visual appeal to your space. Eric Scott and his team are dedicated to doing the job right the first time. Scott Design & Construction offer many other outdoor services for your backyard transformation. If you’ve ever dreamed of having a gourmet outdoor kitchen now is the time to make it a reality. Outdoor entertaining is at its best when you have a comfortable cabana with a fireplace for your guests. You can also change the look of your backyard by installing outdoor lighting, adding fencing, and updating the landscape. Scott Design & Construction is there for all your outdoor living needs. Contact us today! It’s Hot Here in Texas! Don’t Let Your Yard Die. Call Scott Landscaping.